Passengers are welcome to check in to their 4-star hotel LS starting from 3:00 p.m. (please make sure your travel agency is aware of the arrival times of your flight). After settling into your room, enjoy dinner on your own before spending the night at the hotel. We’ll have a panoramic tour of the city. Cape Town is a meticulously preserved city with modern towers in the center, cobblestone roads and a bounty of historical monuments. We’ll then take the Table Mountain Cableway to soak up the 360-degree views of Table Bay and the nearby peaks of the surrounding mountains (if the weather allows it). We’ll have dinner and spend the night at a 4-star hotel LS. During the first part of our day, we’ll visit a place that needs no introduction with regards to its significance in South Africa’s and indeed the world’s history: Robben Island. We’ll have a guided tour of the island and its cells. We’ll return to Cape Town for lunch on the waterfront. Afterwards, we’ll visit the Groot Constantia estate, considered the oldest vineyard in South Africa. We’ll visit the cellar followed by a tasting*. We’ll have dinner and spend the night at the hotel. You’ll be transferred to the airport and fly to Johannesburg to join up with the rest of the safari-cruise group. Departure by coach with your guide. We’ll have lunch before visiting the Apartheid Museum which opened in 2001. It is famous the world over for being the first museum centering on South African history in the 20th century, and more particularly on Apartheid. Afterwards, we’ll set off for a panoramic tour of the city. In addition to being South Africa’s financial capital, Johannesburg is also the city of superlatives. It is indeed the richest town in Africa, with the tallest buildings and widest social discrepancies, but is also infused with one of the best atmospheres you’ll ever come across. We’ll arrive at our four-star hotel LS where you’ll be welcome to settle into your rooms before dinner. You’ll spend the night at the hotel. We’ll take a regular flight from Johannesburg to Kasane, Botswana. You’ll be transferred from the airport to your CroisiEurope lodge on board a small private boat. Take advantage of your trip to observe the numerous bird species living among the flooded flatlands. You may even catch a glimpse of a few hippos or crocodiles basking in the sun! You’ll be greeted by our crew upon arrival and settle into your comfortable lodge. We’ll have dinner and spend the night at the lodge in absolute tranquility at the heart of the wilderness. We’ll journey out on a full-day safari in Jeeps to explore the Chobe National Park that is home to more than 1/4 of the total elephant population in Africa. Enjoy lunch in a “floating restaurant” in the middle of the river where the views of the surrounding nature are unparalleled. Afterwards, we’ll board a small private boat and sail off on Chobe River all the way to Sedudu Island and its marshes. We’ll have dinner and spend the night at the lodge. Join us for a trip to authentic villages on Impalila Island, Namibia, to discover the traditional Namibian houses and customs. We’ll return to our lodge for lunch. This afternoon, you can enjoy time at leisure at the lodge, taking advantage of the pool and comfortable fittings, or join us for a discovery of the Zambezi River on a small private boat. We’ll have dinner at the lodge. Tonight, let a local tell you all about the traditions of this particular island. We’ll spend the night at the lodge. We’ll depart from the lodge for one last water safari in the Chobe National Park area. After lunch, we'll set out for the Kasane airport. On board private planes, you’ll be amazed at the stunning panoramas over Lake Kariba and the changing landscapes of the wilderness during your flight from Kasane to Kariba. You’ll be transferred to board your ship and comfortably settle into your cabins. We’ll start sailing across the lake. Reaching over 140mi/200km in length and spanning a distance of approximately 25mi/40km at its widest point, the lake flooded flatlands, hills and forests alike, creating unique and emblematic landscapes. We’ll have dinner and spend the night on board. At sunrise, we’ll set sail through the rare and mysterious landscapes of Lake Kariba where drowned trees reach skywards from the depths of the reflecting water. We’ll set out on a small private boat to discover the Gache Gache River and its unique wildlife. Gliding along its meanders, large bends and small, unspoiled inlets, you’ll be amazed by the magical atmosphere all around. We’ll return on board for lunch. This afternoon, we’ll sail towards Changa. When the sun starts to set, we'll set out on small private boats to admire the changing colors of the sky. We’ll have dinner and spend the night on board. At sunrise, we’ll set sail towards Kariba to disembark and journey out to the airport. We’ll discover the gigantic Kariba Dam which was created in 1955 to form Lake Kariba. Today, the dam serves as a source of electric power for 70% of Zimbabwe. You’ll get to discover the history and legends surrounding the creation of the lake, including the tale of NyamiNyami, the river god. 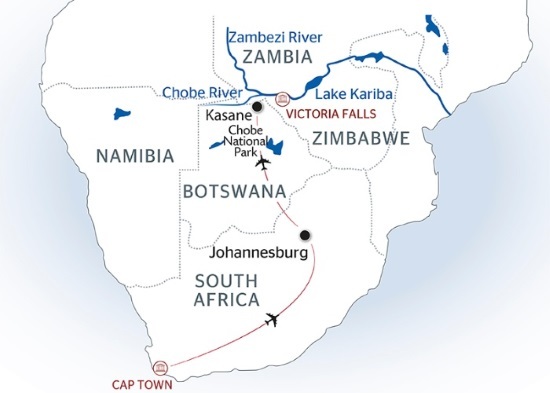 We’ll fly out to Victoria Falls on board private planes. Enjoy an exceptional lunch cruise on the Zambezi River, upstream from the falls. This afternoon, we’ll leave for a tour on foot of the falls where the views are among the most exceptional in the world. We’ll also see where the Zambezi River plunges over the cliff to become the widest waterfall in the world, creating the “smoke that thunders.” Tonight, enjoy dinner and spend the night at a four-star hotel LS. Breakfast. Optional early morning excursion: Soar over Victoria Falls in a helicopter (must be booked before departure). End of our services at the hotel. The tour itinerary can change depending on the weather. The order of the visits can change. The observation of wildlife can't be guaranteed. The helicopter ride, the ascent of Table Bay by the Cableway and the visit of Robben Island depend on suitable weather conditions.